As The New Philips Version Of Philips Hue Came In which You Can Do so Much Things Which Have All System To operate it via wirelessly. 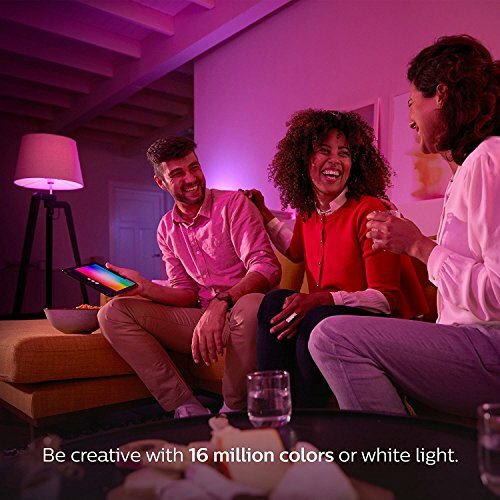 Philips Hue is a personal wireless lighting system that lets you control your lights from your smart device and create the right ambience for every moment. It combines brilliant and energy-efficient LED light with intuitive technology. Enter the world of Hue with a Philips Hue Starter Kit, which includes three Hue bulbs and a bridge. The bridge allows you to add up to 50 light points and luminaires and up to 12 switches and accessories. Just power them and add them to your smart lighting system via the Philips Hue app. Philips Hue will help you get out of bed, and start your day feeling refreshed. The brightness of the light increases gradually, mimicking the effect of sunrise and helps you wake up naturally. Philips Hue promotes your wellbeing by letting you select the right kind of light for each of your tasks and routines, be it reading, exercising, or working. Turn your everyday lighting into an extraordinary experience. Play with colours or sync your Hue lights with music, games and movies. With hundreds of apps to choose from, the only limit is your imagination. With Philips Hue, set your lights to automatically turn on and off, or set the lights to switch on at a preset time to make it seem like you’re home even when you’re not. With the Location Aware function, the lights can be set to turn on as you approach your house so you never have to enter your home in darkness. Never forget a task or miss an appointment. Philips Hue helps you set alarms, notifications, and much more that will remind you to pick up the laundry, go for yoga or call your mom. Do more with Hue! Philips Hue gives you complete control of your lights whether you use the Hue app, voice command or the Dimmer Switch. Hue will be your personal assistant when you want to set the right light for your mood or need reminders for important tasks.